NOTE: This content is old - Published: Wednesday, Jan 22nd, 2014. A story we ran on Monday exploded nationally over the past two days, with both on and offline with coverage. So we went to have a chat with the man who started it all!As you may have already heard, on Monday a promotion held at the 99p Shop on Regent Street got a little out of hand, prompting several people to get in touch with us about the ‘chaos’ that was happening in store. We popped up and live tweeted events, and produced this report online. The story went pretty crazy with several hundred concurrent readers throughout the evening, with nearly 80,000 reads of Wrexham.com. 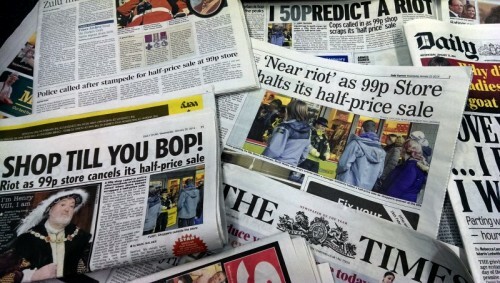 The following day it made local headlines in the Leader, and Radio Wales started the national coverage early in the morning. Online we saw people reading from Reddit.com , Pistonheads.com and various other sites and forums as the story spread. By the afternoon the national news websites had run the story in various guises, South Wales Evening Post , iBtimes , Daily Star, The Guardian , Daily Mirror , Joe.ie, The Metro, The Express, itv.com, The Independent, Yahoo.com, The Gulf Times etc . The story was perhaps depressingly, or amusingly, at one point the ‘most read’ on the BBC News website. The nation’s marmite publication The Daily Mail also chose to run it (article here) with their comments section providing its usual delights. Today has seen the story appear in print (as pictured above), with Wrexham becoming famous or infamous depending on your viewpoint. National radio and television have also mentioned it, again showing it in a jokey light , mockery or using it as a representation of modern day life. Alex Jones from The Bank Bar & Bistro on the High Street was the first to get in touch with us, so we popped up to ask him on his thoughts to the story, his views on the media reaction, and the power of his tweet from a news tip to an international story within 48 hours*. The video also has teaser about a new nightclub opening in town…! The coverage has also been commented on via our Wrexham.com Forums (thread here) with a similar mixed verdict, with some seeing it as amusing whereas others seeing it as a negative view of the town. As always we would encourage you to get in touch via our ‘Your Story’ system – that you can find http://www.wrexham.com/yourstory to get your articles on Wrexham.com . We cant promise they will all go viral, but they will get read by a decent audience !